There are Greco no serial Mint Collection guitars made by Cor-Tek (Cort) with shielding paint and brick shaped (no slope nuts) and most have Cor-Tek (Cort) pots http://forum.japanaxe.com/phpBB3/viewtopic.php?f=20&p=7602 http://www.tokaiforum.com/viewtopic.php?t=4993&start=225. Then there are other no serial Grecos that are very different and have no shielding paint and have the usual sloped nut and have fret edge binding and have a EGC-75 model stamped in the pickup cavity and square shaped pickup cavity routing holes and these are made by Tokai http://www.tokaiforum.com/viewtopic.php?t=4993&postdays=0&postorder=asc&start=210 http://img.villagephotos.com/p/2005-3/981757/GRECOSERIAL.jpg. I've traced the Tokai Square Holes back to late 70s Tokais up to the present and also to the late 70s Burnys that have a Tokai serial number and were made by Tokai and also to some of the Greco no serials that were made by Tokai and also to more recent 2007 Burnys that were made by Tokai and even to some (Martin) Sigmas that were made by Tokai in the 70s. It's amazing to think that Tokai Japan are currently using the same routers that they were using in the late 70s. Tokai pickup routing holes and diagonal wiring channel. Greco no serial EGC-75 pickup routing holes and diagonal wiring channel. OK, Interesting. So do the Tokai made Greco's come from a different factory then Fujigen Gakki? Yes. Tokai have their own guitar factory in Japan. The Tokai made Grecos are made in the Tokai guitar factory in Japan which is where the Tokai guitars are made. So Tokai have made your guitar for Kanda Shokai who own the Greco brand. Also what's interesting about it is that these Tokai made Grecos have no serial numbers. So there are Japanese made Burnys with no serial numbers and Japanese Tokai made Grecos with no serial numbers and the Japanese Terada made K Orvilles with no serial numbers (they do have a sticker serial number). So the theory that guitars with no serials are Korean is just BS. I can only find one of the vintage Japanese guitar brands with no serials that are Korean and that's the Cor-Tek (Cort) made no serial Grecos. so japanstrat...you think this applied to Grecos made this decade? I picked up a GT950S this past weekend...Greco Traditional 950 Standard...and took a few quick picks. I`d be interested to know what you think...it has MIJ pots and from my books I learned it has DRY II p`ups. It has one of the tightest tenon joints I`ve ever seen on any of my Les Paul types. No serial number and 3 screw rod cover...staff assured me it was certainly MIJ. Great neck...feels a bit fatter than my Gibso 50s neck...and up to the construction standards we`ve come to expect from well made MIJs. Shop staff saie they are out of production and they had this one at 40% off...it was an offer I couldn`t refuse. Well I don't have any guitars to compare it to that I know are made in Japan this decade but any guitar that has "Made in Japan" pots points to a Japanese origin. Korean or Chinese made guitars would not usually use "Made in Japan" pots as they can be sourced locally from Korean or Chinese electronic manufacturers and at a cheaper price. I've seen those exact type of pots with "Made in Japan" on them on Japanese Tokais and other Japanese made guitars as well. Also the price of the guitar points to it being Japanese made. a few minutes after posting the question I was looking at my watch list on yahoo Japan and saw someone selling the GT830S and he had a link and I followed it and found the one that I posted about mine... he said his was MIJ. The shop staff assured me mine was MIJ...but I`m never sure about what I`m told here... and I was thinking about the no serial MIJ link...and you may be onto something...at least for Grecos of this decade. plus, some folks seem to think 3 screw rod covers are all MIK too...but I see pics in my books going back to the 70s with Grecos with 3 screw rod covers, so they`ve been doing that for a while. You know the more research I do on MIJs the more I realize it ain`t an exact science. Yes many MIJ Greco have 3 screws truss rod covers,in the 70's/ 80's and 90's. Even very High end models with nitro finish ( wich I doubt can be made in Korea). In regards to the pics posted by JS, would you say for certain that this type of routing, without the shielding paint, is definitely MIJ. Did they ever rout like this on the MIKs, or were MIK Grecos always the "octagonal", shield painted routs? Also, is that a deep tenon? I have a Greco with the same tenon. It looks like a semicircular rout where the tenon stops at the pup cavity, with no tenon inside of the pup cavity or the rout, so its not the "extended" long tenons which go completely into the cavity (or is it indeed a "deep tenon"?). Mine has no markings whatsoever, serial number or otherwise printed in the pup cavity, but is otherwise identical to those pics in regards to the routs and tenon, with fret edge binding, and would like to think it is MIJ. The MIK Cort Grecos have distinctive routing like you say and they often have Cor-Tek pots. A guitar doesn't get installed with Cor-Tek pots unless it's coming out of the Cort factory. The Tokai and the no serial Grecos above are being routed by the same routing machine. 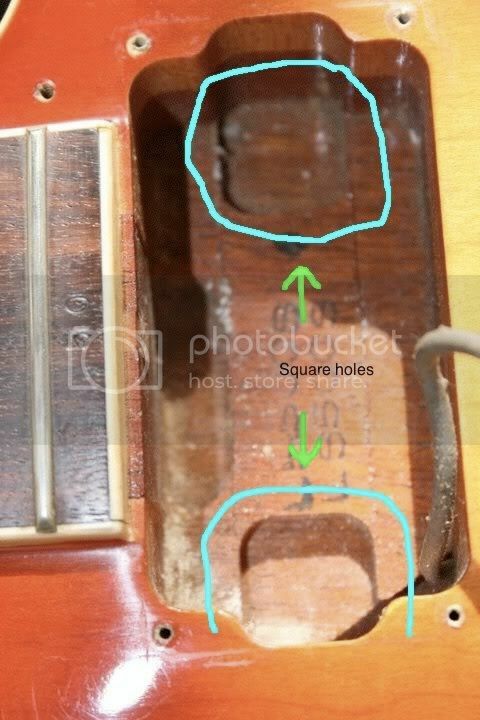 The Square routing holes on the bottom of the pickup cavity are exactly the same. Usually the routing holes on the bottom of the pickup cavity are rectangular in shape for most other factories like Fujigen etc. If your Greco matches the routing above and it has fret edge binding then it would be a Tokai made Greco and the stamp has either faded or been removed or just not stamped in the first place. The tenon above is what I call a medium tenon which is the same as the 1970s Gibson tenon before Gibson went to a short tenon. The semi circular tenon hole in the pickup cavity was just not used but could have been used for what I call a medium long tenon. A long tenon is just like a medium long tenon except it extends even more into the pickup cavity. Where they are made also depends on price. The no serial Tokai made Grecos were at least 10,000 or 20,000 Yen higher in price than the Cort made Grecos. This is around 1988 and guitars were only being made in Korea around that time because it was cheaper to do and therefore the retail price would have been lower than a MIJ equivalent guitar. It's pretty obvious that the Greco no serial guitars were made because Fujigen lost interest in making set necks in the late 1980s, especially low priced set necks as the labour costs/profit returns ratio on the low priced guitars would be the lowest, so Kanda (Greco) looked around at other guitar makers to make them. How does this one fit in the picture? No serial, open 'o'. It has different pup cavity routing from the above, but fret edge binding. I don't think it's a Tokai made Greco. I compared it to a Cort made Greco custom and it is very different. Different routing different fingerboard inlays etc etc so I don't think it's a Cort made Greco. Here is a Cort made Greco custom http://cgi.ebay.com.au/Greco-80-90s-LPC-LP-Custom-Black-Beauty-Guitar_W0QQitemZ190204012964QQihZ009QQcategoryZ2384QQssPageNameZWDVWQQrdZ1QQcmdZViewItem I'd have to see the control cavity and pots before I could come up with something. It seems to have wiring channels and pickup cavity routing like Fujigen does but Fujigen wouldn't be using a brick shaped nut if it is the original nut. But it doesn't look totally like a Fujigen Greco to me so I'd have to say it's maybe a Cort made Greco with different routing. Maybe Cort got a new routing machine. It's still got Cort like yellowish binding (although it's hard to tell by the images) and the brick shaped nut. Could be Fujigen parts sent to Cort for finishing. I don't really know. I would have to look at the control cavity and pots for a better opinion. The guitar seems to have Japanese and Korean elements. It's also originally priced at 60,000 Yen which is what the Cort made Greco customs were priced at so I'd say it might be Fujigen parts sent to Cort in Korea and Cort then finished it and sent it back to Japan with all the other Cort made Grecos. It wouldn't make great economic sense to ship Japanese parts to Korea as they cost more to make in Japan and also they would have to be shipped back to Japan so they would have double shipping charges but in the Grecos case it might make sense to ship some parts from Fujigen in Japan to Cort in Korea because Cort were already making some Grecos and the few shipped parts from Japan would just come back to Japan with all the other Cort made Grecos. Maybe. Here are some pics of my Greco I mentioned in an earlier post. I forgot to take a pic of the fret edge binding, but it has it. Also, see how there is no stamp in the neck pup rout. It had MIJ pots in it before I changed them out with an RS kit. I'm posting pics of some of the areas that are commonly called into question when the MIJ vs MIK issue comes up. So, with these pics in mind, is it safe to say this is a Tokai-manufactured Greco? That front pickup route/ neck end route definately looks like its Tokai..
Also the offset neck joint is a tokai thing as well.